High levels of versican are located with tumor blood vessels in normal B16F10 mice (WT), while the genetic variant unable to produce versican (Vcanhdf/+) had much fewer blood vessels in the tumor (A). 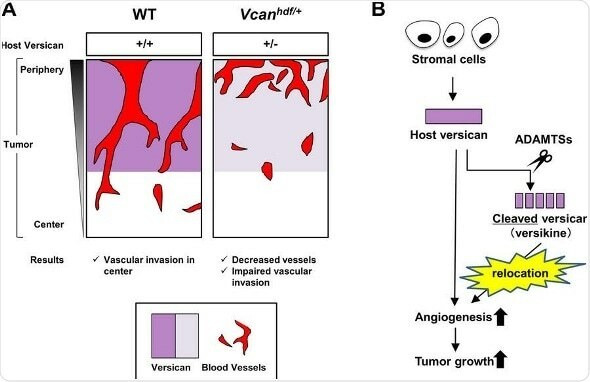 A diagrammatic representation of how the host versican is modified and relocated to promote angiogenesis and tumor growth (B). Angiogenesis is the creation of new blood vessels from the branching of pre-existing ones. This phenomenon is especially important in the context of cancer, because it supplies the tumors with additional oxygen and nutrients to keep them growing. An effective strategy in treating cancer would therefore be to prevent angiogenesis. However, factors in the tumor microenvironment that may boost angiogenesis are still poorly understood. The tumor microenvironment, is a mix of host tissue (stroma) and tumor cells. A recent study in Scientific Reports by Professor Satoshi Hirohata et al. has found a link between angiogenesis and the tumor microenvironment, in the form of an extracellular matrix protein called versican. Versican is involved in several vascular processes, but its role regarding tumor angiogenesis isn’t well understood. Professor Hirohata and his team members at Okayama University looked at different cancer cells lines, and found that although initially they all had varying amounts of versican, tumors derived from all the cell lines had amplified quantities of the protein. Using a technique called western blotting, they showed that a melanoma producing cell line B16F10, had very low levels of versican which increased drastically after tumor initiation, while a lung cancer cell line (LLC) had high levels of versican before tumor induction, which were even more pronounced after. Interestingly, it was found that all the tumors had versican which was at least partly derived from the stromal microenvironment. After establishing the origins of tumor versican, the researchers noticed that versican was located in the vicinity of blood vessels, within tumors. It was also stationed specifically with macrophages (safe-guarding cells in the blood), suggesting that stromal macrophages might be producing it. Versican present in tumors was not in its complete form, but a smaller cleaved form, which is easily distinguishable from normal versican. Finally, to see the direct effects of versican on tumor angiogenesis, the researchers compared two B16F10 genetic variants of mice: one that inherently produced versican, and one that could not. The latter had smaller tumor size and fewer blood vessels, strongly suggesting a firsthand involvement of versican with tumor angiogenesis. This study has found yet another remarkable way in which cancer cells exploit host tissues to proliferate. “Our findings suggest that versican is an intriguing target to consider in combating tumor growth and angiogenesis”, conclude the authors.